EASTON, PA--(Marketwired - April 01, 2016) - With news breaking of cigar maker Rocky Patel's bid for an independent campaign for President, Arthur Zaretsky -- Famous Smoke Shop owner and CEO -- has officially announced his support, and the backing of his heritage company, for Patel's run: "We are overdue in nominating a common-sense candidate like Rocky Patel. I know Rocky. I believe in his platform, and that's why I support his candidacy for President." As the head of the country's largest American-owned premium cigar retailer, Zaretsky is well-acquainted with the new candidate -- and given Arthur's perception of what he calls "overall, a weak field," notes that the Famous Smoke Shop endorsement was earned on the basis of the platform established by the Rocky Patel Cigars CEO earlier today. 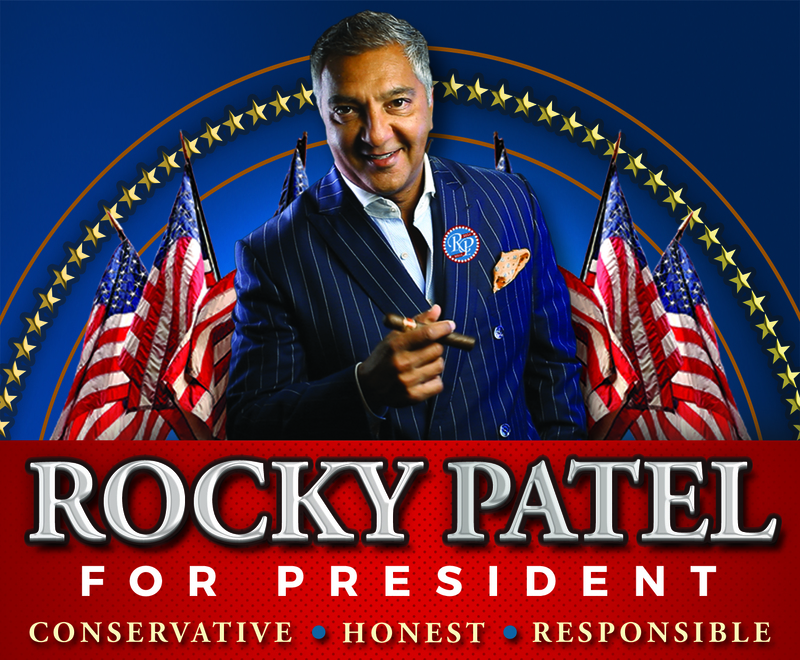 "I'm very concerned about our country's future," says Rakesh "Rocky" Patel, CEO of Rocky Patel Cigars. That concern has encouraged the premium cigar maker to make a write-in bid for President of the United States as an Independent candidate. "Mr. Patel feels the time is right: with the first filing deadlines still 8 weeks away, he has secured enough signatures to compete in 22 states so far -- including Tennessee, New Jersey, all of New England and many of the Southeast and Plains states -- and is well on his way to a spot on the California, Utah, New Mexico and Texas ballots, with substantial grassroots support." He is no stranger to the machinations of Washington politics. In concert with Cigar Rights of America (CRA), Rocky has been fighting for the rights of the cigar manufacturers, retailers, and cigar smokers who have been subjected to massive tobacco tax increases and innumerable tobacco bans nationwide. This has led to the first two pillars of his platform: a lower flat tax for goods and services, and a "Ban the Bans" initiative that he believes will protect local, small businesses from growing losses due to government overregulation. Mr. Patel's bid for the presidency has much more to do with the myriad problems facing the country than the government's role with regard to tobacco. "Overregulation continues to strip away our constitutional rights, our military is weaker than ever, corporate taxes are driving companies overseas, middle-class income is down, and the debt has put our economy on tilt," said Mr. Patel. "There's more concern over climate change than the stock exchange," he added. "What we need is an attitude change, and that's why I'm running for President." With the Democrat and GOP primary seasons already past the halfway point, Patel will be running as an Independent with the hope of getting on the ballot in all 50 states. His platform leans conservative, but Patel is confident he can attract both Democrat and Republican voters, adding that, if elected, he foresees being able to work with members of both parties and put an end to the Washington political gridlock. "First and foremost, we have to balance the federal budget," said Mr. Patel, who was preparing for a rally in Naples, FL. "Federal regulation is way out of control, and it's almost impossible for anyone to start a small business these days. If elected I'll put an end to overregulation, and I've just completed my plan that will lower taxes on corporations and the middle class." Rakesh Patel grew up in Green Bay, WI, and has a law degree from The University of Wisconsin Law School. With that, Patel established a law practice in Beverly Hills, CA, where he represented such high-profile clients as Gene Hackman and Arnold Schwarzenegger. While in Hollywood, Patel became acquainted with premium cigars, and at the age of 33, sold his legal practice. Patel then spent five years in Honduras learning the cigar trade, and in 1995 established the Indian Tabac Cigar Company. Now based in Naples, FL, in 2002, the company changed its name to Rocky Patel Premium Cigars. 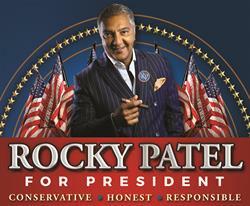 To learn more about the Rocky Patel for President campaign, click here. Attention to Editors: Please note that the content of this news release is intended for entertainment purposes only and may not be factual.